After Tuesday’s CRS-6 mission left the ground to go carry supplies to the International Space Station (ISS), aerospace enthusiasts held their collective breath as they watched the booster’s progress rather than the spacecraft’s. Several minutes after liftoff, the second Falcon 9 landing attempt by Space Exploration Technologies (SpaceX) ended with the target being hit, but evidently a little too hard. The CRS-6 mission, as is usual for Commercial Resupply Services missions, had a single-second window for the launch to happen. Monday saw a scrub due to weather, but liftoff occurred successfully on Tuesday, the next opportunity for launch. Just under three minutes after liftoff, the first stage separated from the rest of the vessel. After that, nitrogen thrusters flipped the vehicle into the proper direction for landing and then a boost-back burn brought it into the correct trajectory for the landing site. A re-entry burn combined with atmospheric drag worked to slow it down, after which its four hypersonic grid fins deployed to control the lift vector. Finally, a landing burn was performed, which was meant to slow the rocket down enough for it to touch down softly and safely. During this, the landing legs deployed, which are made of carbon fiber with aluminum honeycomb. The booster did hit its football-field-sized target – the company’s autonomous spaceport drone ship with the unusual name “Just Read the Instructions” after a ship from author Iain M. Banks’ “Culture” book series. However, this was not quite the desired soft touchdown. “Looks like Falcon landed fine, but excess lateral velocity caused it to tip over post landing,” tweeted SpaceX CEO and founder Elon Musk in the aftermath. 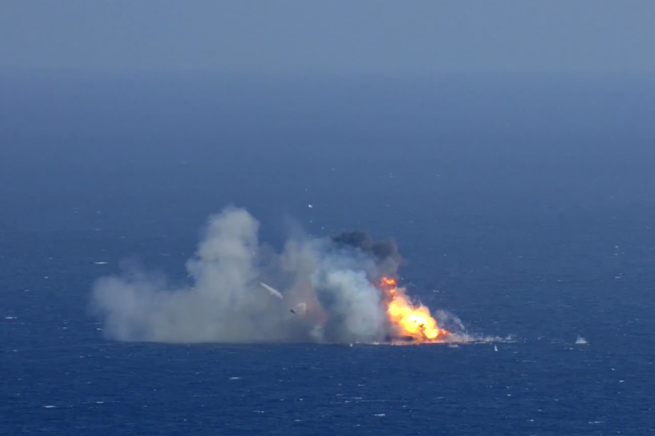 Despite the sub-optimal landing and subsequent fireball, which can be viewed in the video below, the barge is nearly undamaged, according to Musk. “Droneship is fine. No hull breach and repairs are minor. Impact overpressure is closer to a fast fire than an explosion,” he tweeted on Wednesday. The company tested their rocket landing concepts using a 10-story-tall Vertical Takeoff, Vertical Landing (VTVL) vehicle they called the Grasshopper. 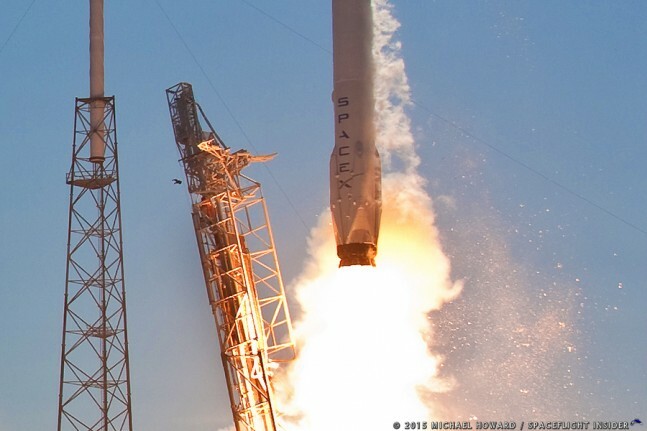 It consisted of “a Falcon 9 first stage, a single Merlin 1D engine, four steel landing legs with hydraulic dampers, and a steel support structure,” according to SpaceX. The vehicle did see eight flight tests with successful landings in 2013, with a top altitude of 744 meters up. After Grasshopper, SpaceX tested their F9R development vehicle – basically a Falcon 9 first stage with landing legs – in McGregor, Texas, with several successful attempts and a top test altitude of 1,000 meters. Their first real-mission attempt to land a Falcon 9 first stage was CRS-5 in January of this year. The experiment ended in a “Full RUD (rapid unscheduled disassembly) event,” as Musk described it at the time. The rocket had run out of hydraulic fluid, which was necessary to steer the grid fins that kept the stage pointed upright. Another attempt was planned for February, with the launch of the DSCOVR orbiter, but due to stormy weather and dangerous waves, the landing attempt was scrubbed and the booster was directed for a “soft landing” in the water instead. The rocket was not expected to survive in that case. The next opportunity for the company to try to stick the landing will be the CRS-7 mission, which is currently targeted for June of this year. According to Defense News, Gwynne Shotwell, SpaceX president and COO, said on Wednesday that they hope the next landing will take place on land, not at sea, for the added stability of firm ground. The color-corrected video of Tuesday’s landing attempt was posted on Wednesday evening and can be viewed below. Kudos to SpaceX for your private advancement of the space program! The booster landing looked so close! I’m sure you will get it at some point. How about a device on the barge that will capture the booster in an upright position? So close. Looks like these rocket scientists are getting closer with each attempt and success should happen soon. Be patient while the issues are being worked out and the payoff will be huge. Congrats to all involved. Great report! Excellent balance between excitement and reality. I go to “SpaceFlight Insider” first thing every morning; other space websites are so boring. You go,girl! Seems to me like the rocket should try to “hover” above the platform before trying to land. Give itself a chance to straighten up and level out. Can the rocket do that? Third time’s a charm! Even one of the engines throttled to their minimum (70%) has too high a thrust to rate ratio. It looks like it was probably a control lag problem, considering the sizes involved I’d guess a minor fix. I wouldn’t be surprised if there are a few more failures because there is a lot to account for and the first time it’s been done. I give props to SpaceX for trying, and I expect that they will get it right, probably sooner rather than later. At one point Musk Tweeted it was a sticky bi-propellent valve (presumably on the one engine still firing during the landing attempt). From what I understand, this caused a delay in the throttle response of the engine that was too slow for the control system to completely cope with. If this is the case, I would expect that this problem will be addressed before the next landing attempt. Also, congrats to SpaceX on Falcon 9 successfully putting Dragon into orbit. That was the main mission. The failed landing attempt was a test. Since they were going to fly the first stage anyway, it makes perfect sense to perform a landing test. 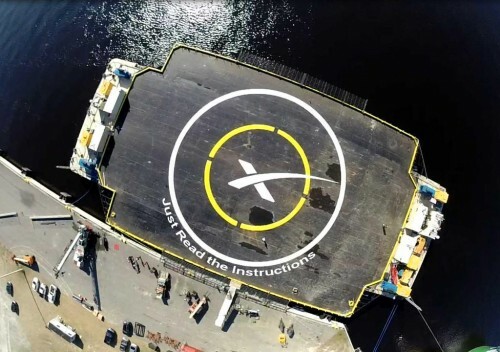 I’m absolutely amazed at how big the rocket is in comparison to the landing drone ship site. Also impressed with the amount if vertical speed that the vehicle has to overcome for landing, and the amount of maneuvering that is done in the final moments. Looking forward to attempt number 3. Am I correct in observing that the centre engine has thrust vectoring capability as part of its landing maneuvering? every aerospace student or engineer with even little knowledge about feedback will recognise instantly a classical case of loss of stability.. elon musk explanations are not reliable even only because have bee posted minutes after crash.. analysis of telemetry take time, analysis of cause of unexpected behaviour of complex system take even more time.. and stupid public speculate on that false explanations.. I even imagine how tricky elon have pre-written explanations.. and the press broadcasts nonsenses like ‘hypersonic (sic!) x-wings stops working right before landing’ or the legend of slow valve discussed there.. open your eyes: increasing swing (rotational velocity osculations) cause the crash AND EXPOSES INHERENT INSTABILITY OF CURRENT ARRANGEMENT..
spacex appear to be confident a some adjustments of certain parameter will fix the problem.. probably they began to bereave their own propaganda too.. with no redesign the next attempt would be successful only by chance.